Fylde RFC assistant coach Dan Orwin admitted they had to battle before eventually edging past Leicester Lions at the Woodlands. Fylde stretched their unbeaten run to nine matches with a hard-fought 14-13 victory against their visitors on Saturday. Two converted tries in the opening quarter of an hour had seen Fylde 14-0 ahead before the Lions got back into the game. 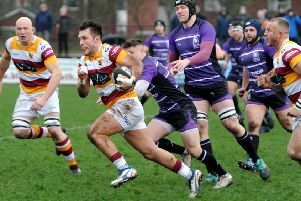 Despite seeing their lead cut to one point with more than 20 minutes to play, Fylde held out to remain third in the table, 10 points adrift of leaders Hull Ionians. “I thought we made very hard work of it,” said Orwin who, along with Alex Loney, took charge as head coach Warren Spragg was absent on the day because of duties elsewhere. “We got off to a very good start with a brilliant first 20 minutes but then we struggled to get field position, any sort of cohesion and ball retention. “It was a real battle for us, to be honest. “Early on we realised we had the advantage around the edges, we moved the ball well and we made a lot of line breaks. “The Lions adapted very well. They upped their line speed, pressurised us very well and we struggled to find those edges after that. Fylde are back in action on Saturday at Sheffield Tigers, who won the reverse game at the Woodlands earlier in the season with the last kick of the match.